Bognor tanned by Tanners - is that the play-off dream over? Leatherhead made Bognor look very ordinary in a convincing four-goal victory at Nyewood Lane which all but ends the Rocks' play-off hopes. The result means Bognor are tenth and eight points off fifth place with only six games left - and they have now not won in their past six. 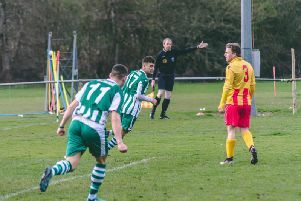 There were debuts for new recruits Reece Myles-Meekums and Ashton Leigh but Dan Lincoln was still not quite fit to play, who was on the bench as the game kicked off. A long free-kick by Craig McGee was well gathered by Rocks goalkeeper Petar Durin inside the first minute. Mason Walsh won a free-kick on the left but Theo Widdrington's ball in was well gathered by Zaki Oualah. Ibrahim Olutade had the first strike of the day but hit it wide after cutting inside from the left. Durin saved from Daniel Gallagher, getting down low to his left. Myles-Meekums responded for the Rocks when he ran on to a Widdrington pass, but his shot was blocked by a defender. Gallagher won a corner and Travis Gregory's kick was palmed away by Durin. Olutade ran at goal and found Gallaghe,r whose shot was feeble. Myles-Meekumscross from the right was beyond Bradley Lethbridge. Durin spilled Oualah's long kick and Olutade's low attempt was blocked on the line. Jack Skinner was causing Bognor problems on the right but his cross left much to be desired as Durin claimed it. Leigh headed out another Gregory corner. Leigh went into the back of Skinner near the halfway line meaning a free-kick was awarded. The punt forward saw Olutade knock it down before Skinner’s shot from the edge of the box flew low into the net on 23 minutes. Widdrington's cross fell kindly to Lethbridge who hit it on the volley on 26 minutes but it came off the underside of the crossbar - before Walsh's scissor kick flew high and wide. Olutade had Keaton Wood beaten but his strike was straight at Durin in Bognor's goal on 30 minutes. Skinner beat Leigh on the right before his cross bounced through to an unmarked Gallagher, who struck a deflected shot wide. Lethbridge teed up Tommy Scutt but his shot rolled wide of the post. Harvey Whyte ran on to a Doug Tuck pass but smacked his shot over. Myles-Meekums combined with Lethbridge but he fired a shot too high. Izunna Ikebuasi did well on the right and his pass inside the box to Gallagher ended in him shooting wide. A Gregory cross flew wide of the goal then Leigh's cross was well stopped by Oualah with a fine catch. Durin's kick went straight to McGee who struck a bouncing shot wide on 53 minutes. Myles-Meekums cut inside from the right before firing low at goal but it was pushed around the post by Oualah on 60 minutes. Richard Gilot replaced Widdrington on 61 minutes. Jerry Nnanimi headed wide when unmarked in the box, then Skinner shot from long distance along the deck but wide. Walsh smashed one high and wide. Oualah went into the book after dissent on 67 minutes, then Wood saw yellow for a late challenge, before Scutt was replaced by Leon Maloney on 71 minutes. Chad Field had taken a blow to the head and was replaced by Ed Sanders. Leatherhead made it 3-0 on the counter when Wood slipped up to allow Olutade in and he knocked it beyond Durin and in on 77 minutes. Ikebusi went into the book on 79 minutes for the visitors. Tuck also was booked on 81 minutes and it got worse for Bognor three minutes from the end of the 90 when Greogry, who'd been a thorn in the Rocks side all afrernoon, netted after he cut inside,belting the ball low under Durin to end another forgettable game at home for Bognor. Bognor travel to Wingate & Finchley next Saturday in search of their first league win in seven.